Meet our newest WWPR member: Erika Dyer! Erika has a substantial background in state and local politics homegrown in nearby Virginia and has recently put her public affairs skills to work at a PR firm. Erika serves as an account associate for Ketchum, Inc., in the public affairs. She loves that Ketchum has allowed her the opportunity to further develop the skills she learned on the campaign trail and recently celebrate her one-month anniversary! In her new role, she also appreciates being surrounded by so many smart and talented women after working in a male-dominated field for most of her career. Before joining the PR firm, we spent eight years in politics, working on numerous Republican campaigns throughout Virginia and as the communications director and legislative aide to Springfield District Supervisor Patrick H. Herrity in Fairfax County. 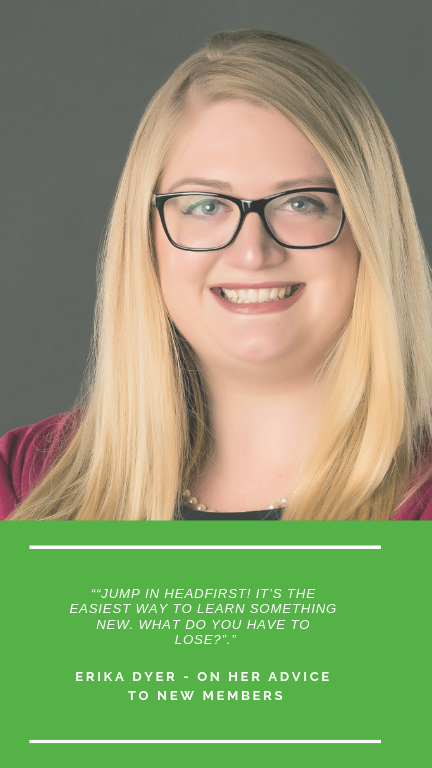 Erika first learned about WWPR a year ago through the Northern Virginia Chamber of Commerce, but she was initially hesitant to join since it was based in D.C. Then she attended the Women of the Year Awards Luncheon on an invite from her PR firm and signed up on the spot. WWPR seemed like a natural fit for the next step in Erika’s career and a great way to embrace the PR world. She is excited to soak up as much knowledge and advice as she can and expand her network! She’s even hoping to put her event planning skills to good use by joining the Awards Luncheon committee where it all started, or with another event committee. In addition to WWPR, Erika is a huge advocate of giving back to the community. She is the marketing chair of the Make-A-Wish® Mid-Atlantic Community Leadership Council, serves with the Junior League of Northern Virginia, and holds a variety of leadership positions in Virginia political organizations. When she’s not at the office or giving back, she loves experiencing what DC has to offer. Despite growing up in Northern Virginia, she’s rarely ventured into the city so she’s been steadily exploring the hidden treasures and touring off-the-beaten path locations. At home, she’s a huge fan of Agatha Christie’s mysteries and cuddling with her two rescue cats, Ronnie and Poppy.